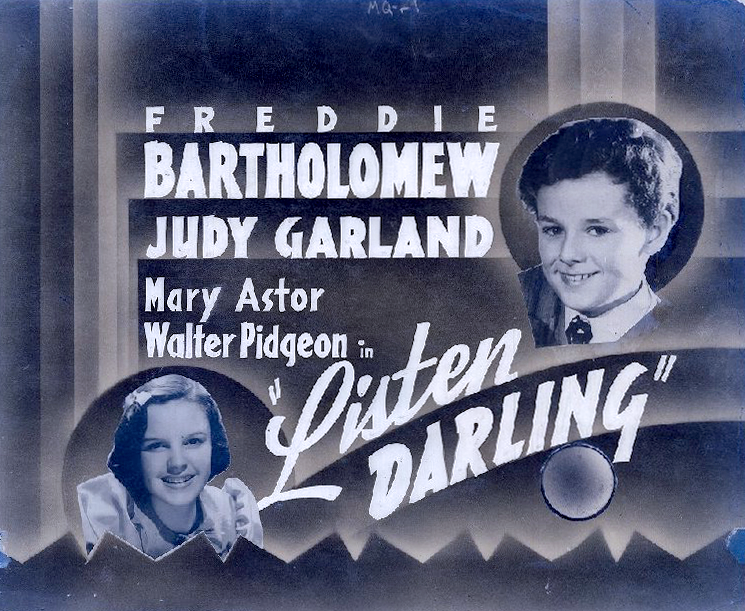 The last of Judy’s MGM films to make it to DVD, Listen Darling, will finally be released through The Warner Archiveon March 20th. Rare "Listen Darling" glass slide, projected in theaters to promote upcoming films. Listen Darling is the film Judy completed just prior to filming The Wizard of Oz. It features the only time she sang her signature song “Zing! Went the Strings of My Heart” in a movie. “Zing!” is one of the songs she sang for her audition at MGM in 1935. It’s also the song she sang on the radio (again in 1935) the night her father was dying in the hospital. She kept it in her repertoire throughout the rest of her life. The version sung in the film is abridged, but the complete pre-recordings of both the ballad and swing versions can be found on various CD compilations and The Judy Room’s MP3 Page (scroll down to 1938). The film itself is a charmer. It’s one of those MGM “B” movies that come off as almost an “A” movie. That’s how MGM was – always a class act. Freddie Bartholomew co-stars along with Scotty Beckett, Alan Hale (father of Alan Hale Jr. of “Gilligan’s Island” fame), Walter Pidgeon, and Mary Astor. Astor plays Judy’s mom, a role she’d repeat in 1944’s Meet Me in St. Louis. Judy also sings the lovely, and underrated, ballad “Ten Pins in the Sky.” You’ll enjoy this “minor masterpiece” so definitely pre-order it. Check out The Judy Room’s Listen Darling Page for details about the film.